Do you have any questions about Logbook Suite oder problems? On this page we have collected some troubleshootings. All views are developed for the landscape format. For this reason, we recommend that you lock the iPad to the landscape format while using Logbook Suite. The minimum system requirement for Logbook Suite 1.4 is iOS 11.2. Please note that on Windows computers you only can make entries in database software from accounts with administrator's right. Therefore it is necessary that you install Logbook Suite with an account with all administrator privileges. Nevertheless, with some Windows installations the administrator account hasn't got all rights that are required for the use of a database software. This is particularly the case for computers with additional accounts. You may recognize that every time Logbook Suite is started, a message is shown, that an update of the data files has been executed, even when nothing has been updated. Start Logbook Suite using the context menu of the program and select "Run as administrator". Alternatively you can set up the link to the program Logbook Suite thus the software automatically gets always the administrator privileges. In the context menu choose the entry "Properties", click the "Shortcut" tab, then on "Advanced" and activate the "Run as Administrator" check box. To finish click OK. In some cases, in addition to the step above the access rights of the databases contained in the program folder of Logbook Suite (the files with extension fmp12) need to be manually changed to full access. If the access rights of the database files in the program folder were not correct, you should also check the access rights of the files in the data folder of Logbook Suite (the folder "Logbook Suite" is in the top level of your boot drive). Correct the access rights of this files if necessary, too. Remove all backup files which have been created during your attemps to start Logbook Suite. In order for Logbook will be able to receive GPS data on the iPad, you need to have activated the Location Services for Logbook Suite and, if used, for LogbookNMEA connect in the Settings app of the iOS. Logbook also offers a simple function for getting the position from the internal GPS, but if you want to enter further navigation data automatically or if you want to get the navigation data from a NMEA data source, you need to use our free iPad app LogbookNMEA connect (at least version 2.1 for Logbook 3.10). The app is the connection between Logbook and the GPS or the instruments. Please note, before you can receive data, you need to setup the data source in LogbookNMEA connect. For more information, read the Logbook manual. If you are using an older version and encounter a problem with the file, you can download the new version via Logbook Manager from our website into Logbook Suite and then import your data from the old file. 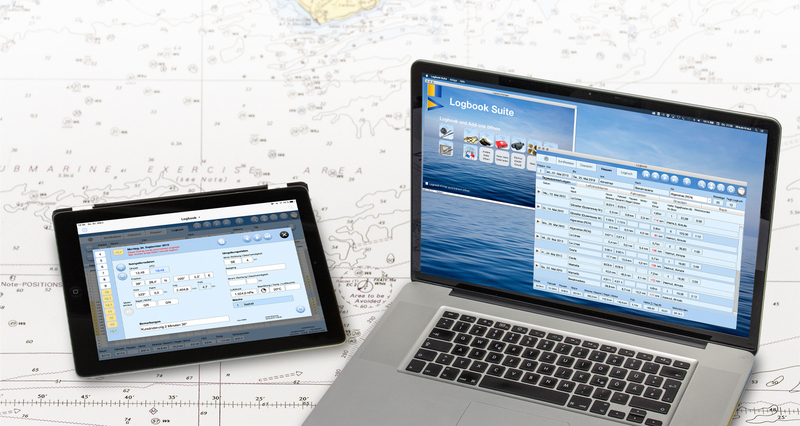 All our customers who own a Logbook license for Mac or Windows can download the new version Logbook Suite 1.4 from their 2K Yachting Shop Account without the need to fill out our download form again. Just ignore the version number that is displayed in your account! All versions of Logbook are now automatically linked to the download of Logbook Suite 1.4. The update for iPad can be loaded from the Apple App Store as usal. When installing Logbook Suite 1.4 your data files from older versions of Logbook Suite are automatically updated. However, the automatic update affects only files with default file names in the default data folder, other files need to be updated manually to version 1.4. If you have already used an older version of Logbook (version 2.0 or newer), you can open your logbook file created in the older version of the pogram also with Logbook Suite. But the file will only provide the functions of the original version of the program. Therefore, after installing Logbok Suite, you should import your old logbook files into Logbook Suite so all the new features will be available. The following instructions explain all the necessary steps on the PC or the iPad. If you want to update older data files (Logbook minimmum version 2.0, Add-ons all versions) to Logbook Suite 1.4, you can do this very easily using the automatic updating function. Copy your data files from older versions into a folder. All files need to use the standard file names and the extension .fmp12. If necessary, you should edit the file names using the Finder or the Explorer before starting the function. Please note that all files need to be closed when performing the update. In Logbook Manager choose the button More… and then the button Import data from 3.7. When you have seleceted your folder the update process is started. After a few security messages, the data from the old versions are imported into the files of Logbook Suite 1.4. A step-by-step instruction for a manual updating is provided in User Manual Basics. In order to update older data files used in FileMaker Go, these files need to be loaded into Logbook Suite. To do this you can use the functions in the file browser of FileMaker Go. Close the file in FileMaker Go and then switch to the file browser. At the bottom select the middle button Device, then tap the page icon on the top right. Now select the file that should be copied to Logbook Suite and tap in the top left of the Action icon. From the middle row choose the button Copy to Logbook Suite. If there is already a file with the same name stored in Logbook Suite, you can now choose whether it should be replaced or whether the transferred file should get a new name (option Keep both). In this case, a number is added to the file name. Please note: Do not use the standard file names of Logbook Suite. Using the button Import data from 3.7 and older from the menu of the button More… of the Logbook Manager you can perform an automated update of your data from older versions (Logbook starting version 2.0, Add-ons all versionen) to Logbook Suite 1.4. Please note that all files should not use the standard file name and should be closed while performing the update. In the Logbook Manager tap the button More… and then the button Import data from 3.7 and older. In the popover choose from the first list which module you want to update. Then select from the second list the file containing the data to be imported from. The list contains all files stored in Logbook Suite except the default files. Tapping the button Update starts the import process of the data. Because of the file system on the iPad, the update must be executed one by one for each file. Since version 2.0 Logbook uses a file format which is not compatible with older versions of Logbook, all logbook files which had been created with versions before 2.0 can't be opened and edited in Logbook 3.7. Please contact us if you are interested in a data conversion. inside of your user folder "c:/Logbuch-Daten"
inside of your user folder "c:/Logbook 2"
inside of your user folder "[system drive letter]:/Logbook 2.5"
inside of your user folder "[system drive letter]:/Logbook 3.0"
inside of your user folder "[system drive letter]:/Logbook 3.1"
inside of your user folder "[system drive letter]:/Logbook 3.5"
3.6 with standard installation: "Documents/Logbook 3.6"
with standard installation: "[system drive letter]:/Logbook 3.6"
3.7 with standard installation: "Documents/Logbook 3.7"
with standard installation: "[system drive letter]:/Logbook 3.7"
with standard installation "[system drive letter]:/Logbook Suite"
While Logbook is in demo mode and there are less then five days in the logbook, you can test the NMEA feature for PC and iPad. We strongly recommend to test the NMEA connection between Logbook and your equipment before purchasing the PC NMEA License. The connection should work with all NMEA and GPS devices that are connected to the PC using USB, Bluetooth or WiFi. Nevertheless there could be some devices on the market that are not compatible with Logbook. We are very grateful for any feedback—regardless of whether the connection is working or not! While Logbook is in demo mode and there are less then five days in the logbook, you can also test the Logbook NMEA function for iPad. Once you have created more than five days, the feature is only available if you have entered a NMEA serial number for iPad. The following list shows the hardware, for which the app provides preset configurations. If you want to use a hardware that is not listed, please contact our support. Our NMEA function for iPad uses the app LogbookNMEA connect, which has been developed exclusively for Logbook, to connect Logbook to NMEA data sources via WIFI, Bluetooth or cable. For use with Logbook Suite 1.4 (Logbook 3.10) the minimum version of LogbookNMEA connect is 2.1. Version 2.1 offers pre configured settings for the following devices or connections. You can also connect other devices via LogbookNMEA connect with Logbook, if you know the configuration settings which are used to connect your iPad to your GPS/NMEA device. 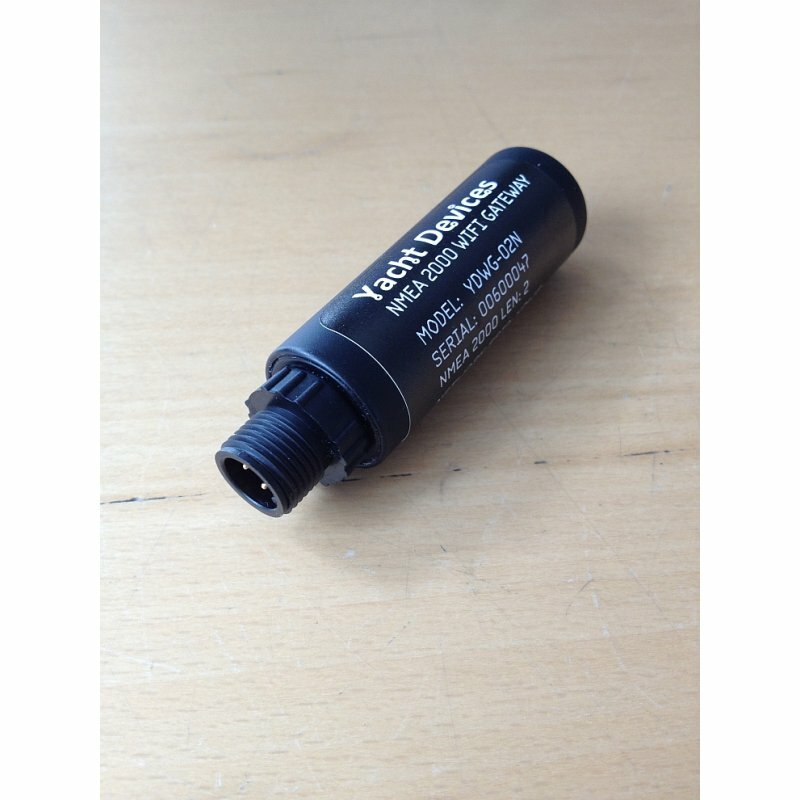 the NMEA 2000 WiFi Gateway YDWG-02 von Yacht Devices. You can purchase the device directly on the website of the manufacturer. The current price is about 190 €. We also have had great experiences with the GoFree Wifi-1 Modul from Navico (Simrad, B&G, Lowrance) during our tests. This is available in nearly every well sorted ship supply store. Please also note the tip on setting up the GoFree connection. Incorrect settings in popover the NMEA/GPS can cause that no data transfer is possible or that it takes a long time until the data are entered in Logbook. Therefore in the popover NMEA/GPS only the options for the data that really can be received should be enabled. Otherwise Logbook will wait for unavailable data until the timeout. This applies particullary to the option iPad Pressure, which should be activated only if the iPad has an integrated barometer. In the app LogbookNMEA connect, which is used for the data retrieval, you also need to setup and activated the source iOS barometer in addtion to the source for receiving the navigation data. With some GoFree installations, the automatic detection of the default setting GoFree stored in LogbookNMEA connect no longer works correctly. On your plotter go to the plotter configuration page. Look for the IP of the plotter, which is also displayed here. Write this down. Open the app LogbookNMEA connect and choose Source, Edit, Add source. In the top you can give this source a name, for example GoFree manually. If you now activate the source, data should be displayed in the blue field. Unfortunately, the plotters from Raymarine, Furuno and Garmin don't stream the standard NMEA data via the integrated WiFi. The WiFi only sends specially prepared information for the own-brand apps in a vendor-proprietary, non-public data format. Unfortunately the manufactureres are not interested in releasing the interface for use by third-party software. This is why you need to have installed a NMEA multiplexer with WiFi function in your ship network to access the NMEA data from any other device or application—even if you use a plotter with wireless LAN function. LogbookNMEA connect also simplifies the data entry into your logbook, if you are not connected to an external NMEA data source, but only want to use the iPad’s internal GPS module (only iPad models Cellular, 4G or 3G). Using LogbookNMEA connect the GPS data from internal GPS are captured significantly better becauseLogbookNMEA connect reads the data until it has received reliable data and then passes it on to Logbook. In addition LogbookNMEA connect calculates course and speed over ground from iPad’s GPS. So you get two additional values that are automatically entered into your logbook. New button that inserts the generated Google track as image on the sheet "Track"
Simplified entering of name lists for "Aboard". This update fixes a few minor bugs in Logbook and some Add-ons.